As the owner or operator of a hydropower site, you may be familiar with some of the issues associated with conventional hydropower screens, principally those relating to regulation, accumulation of debris and the knock-on effects of reduced generation and income, as well as the manpower time required for debris removal. 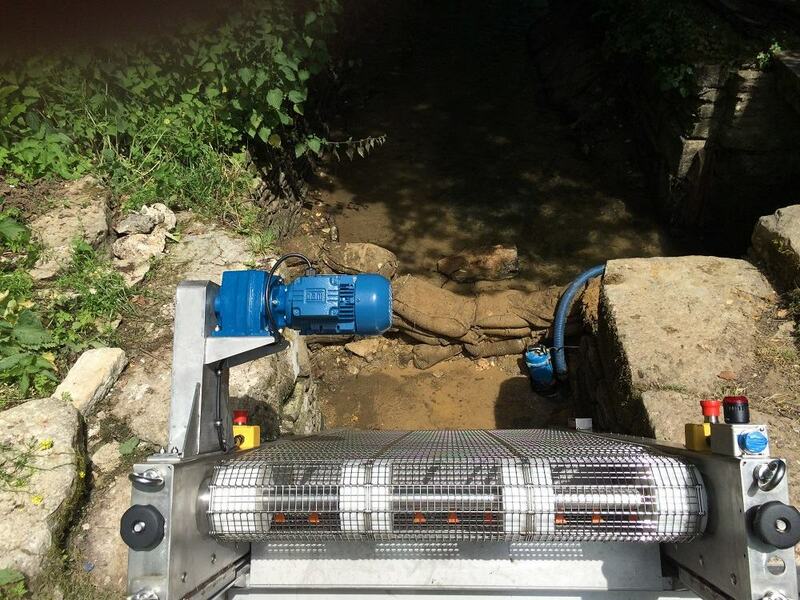 The GoFlo travelling water screen can offer significant regulatory, technical, operational and financial advantages for hydro sites of all kinds. You may be aware that screening at some hydro intake points must comply with increasingly stringent fish and eel screening regulations. The Eels (England and Wales) Regulations 2009 is implementing a phased compliance approach through to 2027. This regulation relates to screening for both intakes and outfalls. Check here to find out what this could mean for you. Screening for juvenile eel, for instance, can require mesh sizes down to 2 mm bar-spacing. Such low bar-spacing can only be effectively kept clean at high-volume water intakes using a rotating-mesh screen with a debris removal spray, such as the GoFlo screening system. As well as regulatory compliance, the technical design features of the GoFlo self-cleaning screen also offer a range of advantages, including a robust corrosion free stainless steel construction, self-lubricating bearings, a pivoting base for quick installation and removal, automated debris removal with a spray and flushing system, fully modular design for multi-screen requirements, and scalable capability. The operational benefits of GoFlo self-cleaning screens for hydro operators are also far reaching. The screens are sensor controlled and feature a fully automated rotating screen and debris removal feature, requiring minimal manual input. GoFlo also features a local and remote control and monitoring system, further reducing human input. The screen cleaning cycles can be activated by sensors detecting differential water levels across the screen, or programmed at fixed time intervals, or manually activated either onsite or remotely. The GoFlo control system is a full PLC-based system with internet connection for remote access and includes a webcam for watching the screen anywhere in the world. Combined with an extremely low maintenance design, the control system acts to maximise flow and power generation at all times. GoFlo travelling water screens make good sense financially too. Travelling water screens ensure a significant reduction in hydro downtime and reduced flow. This increases output and generating income, as well as reducing the costs of manpower intervention. Use our online calculator to see how a GoFlo can save you money. GoFlo travelling screens are designed by hydropower engineers to maximise energy generation from hydropower systems and to minimise the headache of manual debris removal. Our case study below explores the benefits of hydropower and GoFlo travelling screens on a 2 screen site in North Wales. View the case study here: Case Study – Cochwillan Hydro and GoFlo.